Should You Be Taking Mucinex and Breastfeeding? Taking Mucinex while breastfeeding is considered fairly safe, but there have been no conclusive tests. According to the American Academy of Pediatrics, the active ingredient in Mucinex, guaifenesin, is considered to be in the L2 (safer) category. Basically, they don’t know of any ill effects but there have not been any controlled studies in humans or animals. Some doctors do not recommend it for that reason but most follow AAP recommendations consider it safe. There is also no information available on how much guaifenesin actually gets into your human milk. Generally, in a drug like this, the amount would be very small. Since the amount that actually gets to your baby has not been shown to have any side effects, we would be very comfortable using it. Just keep in mind: less medication is generally better than more. 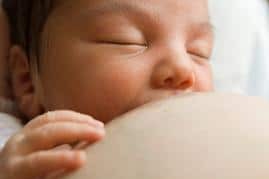 Nursing moms should choose the lowest dose of any medication that is recommended and still eases her symptoms and helps her to feel better faster. But don’t feel bad about taking this if you are miserable; most babies are much happier with a healthier mom! 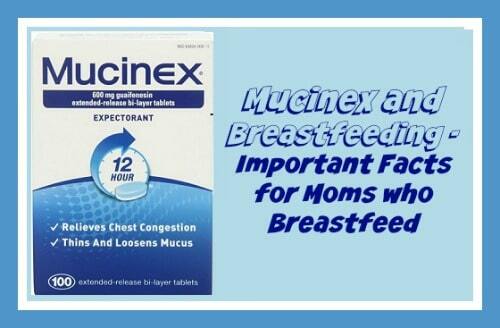 However, if you are still concerned about Mucinex while breastfeeding, just remember that you can help decrease the amount of any drug that enters your breastmilk by taking the medication just after you have breastfed your baby or just before she is due to have a long nap! In addition, you can try to minimize the amount you take of Mucinex and supplement with sore throat sprays or lozenges which are generally considered very safe for nursing babies!